Sign up for Barilla's quarterly e-newsletter and receive up-to-date industry news, trends, recipes and offers.Sign Up! Vegans need to make sure they get enough protein, so this bowl uses superfoods like quinoa and edamame to meet that goal. Baby kale and maitake mushrooms add flavor as well as nutrients. For an added dose of protein or grains, use PLUS Protein or Whole Grain Rotini. Cook the Barilla® pasta for 1 minute less than the time indicated on the package. Drain pasta and drizzle with some olive oil to prevent from sticking. Place pasta flat on sheet trays or hotel pans and cool. Refrigerate and use within several hours. Cook the quinoa per package directions. Spread it flat on sheet trays or hotel pans and cool. Refrigerate and use within several hours. Saute the mushrooms with olive oil until tender; season with salt and pepper. Let cool. Make a vinaigrette with 1/2 cup olive oil, the lemon juice, and season with salt and pepper. Pour half of it over the cubed avocado and toss to coat. Season the edamame lightly with truffle oil. 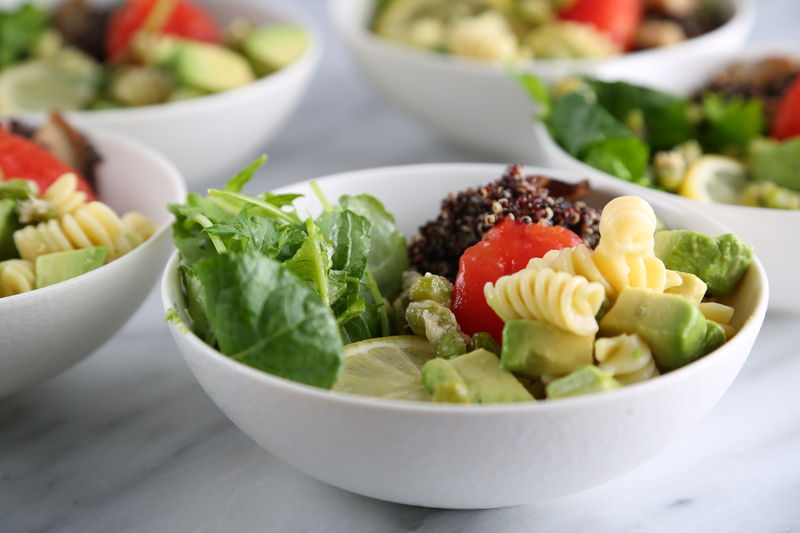 For each serving, layer some avocado, 1/4 cup tomatoes, 1 cup pasta, 3/4 cup kale, some mushrooms, and 3/4 cup quinoa. Top with 2 Tbsp edamame and more vinaigrette. Please note: for the purpose of the nutritional assessment, total sodium does not include salt added to the cooking water. When salt is listed "as needed" in the ingredient list, 1 tsp total is included in the analysis. CONTAINS WHEAT INGREDIENTS. THIS PRODUCT IS MANUFACTURED ON EQUIPMENT THAT PROCESSES PRODUCTS CONTAINING EGGS. SIGN UP TO KEEP UP! Click here to sign up for Barilla's quarterly e-newsletter and receive up-to-date industry news, trends, recipes and offers. Sign Up!